At Paws and Love, we believe all cats deserve a chance at happiness and that includes cats who have been diagnosed with FIV. These cats usually live long, healthy lives and do not infect other household pets. The image graphic shares a lot of important information about them and dispels some of the well-known myths that have been passed along. 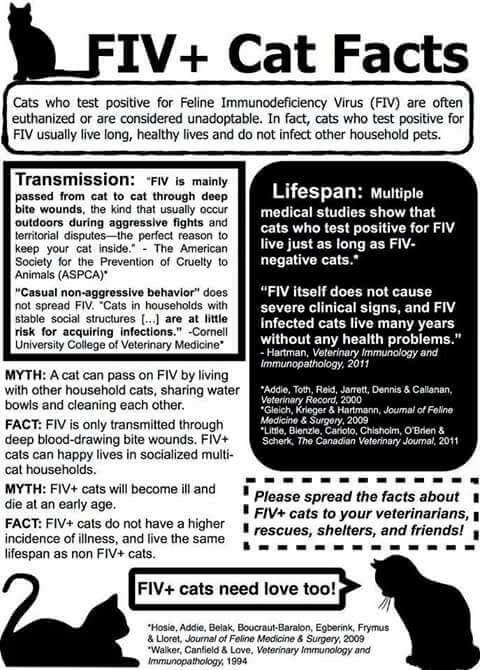 We hope that since you're on this page, you are considering the possibility of providing a loving home to an FIV+ cat. We have several available for adoption and many more are always in need of homes. King Henry (pictured top of the page) ADOPTED!!! Interested in adopting? Please fill out the application linked below and we will get back to you ASAP.